Equipping Churches the world over, the Church Hymnal gives the word and music to lead worship in a heartfelt and sincere manner. The first new edition of the popular Church Hymnary for over thirty years, and edited by some of the best-known names in Christian music, this long awaited publication contains over 750 hymns and 100 psalms. Approximately a quarter of the new selection is made up of new items written since the third edition was published in 1973, not least from Iona which has made such a distinctive contribution to modern worship music. Many more entries have been introduced from around the world, primarily the USA and New Zealand, but also translations and adaptations of little known material from such countries as Hong Kong, Singapore, Korea, Japan and Zimbabwe. These compliment the traditional and contemporary hymns and tunes from established authors and composers. 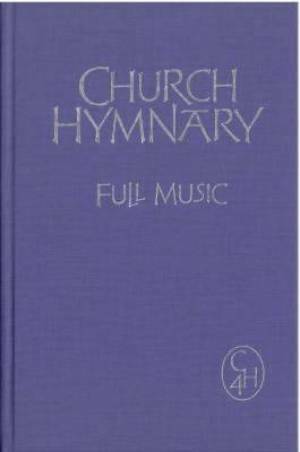 Church Hymnary 4th Ed Full Music by Church Hymnary was published by Canterbury Press in May 2005 and is our 4967th best seller. The ISBN for Church Hymnary 4th Ed Full Music is 9781853116131. If you're involved in any serious way with church music and you're a member of the Church of Scotland, there's no question that you'll want one. But is it useful to those outside its main audience? I'm in no doubt that it is. I'd even recommend it to leaders of guitar-based worship bands. There are modern big hymns that will work well with any kind of accompaniment as long as it's loud enough, and there are some very useful short songs from Europe and from the Global Church which I'd not come across before. I'm also finding some very useful new hymns for particular occasions through the Biblical index, though I confess I don't always run with the recommended tunes. It's a book well worth exploring, whatever your tradition. Got a question? No problem! Just click here to ask us about Church Hymnary 4th Ed Full Music. Do the hymns retain the same index numbers as the previous editions? A:No, the Church Hymnary contents are arranged alphabetically, so any previous editions will have been superseded.